A quick fantasy animation about planting magic seeds! The movie is 15 seconds long...just watch it why don't ya? It's always funny to describe this little animation to people, because it takes about ten times as long to explain as it does just to watch the durn'd thing. Basically a hand plants some seeds in a pot, then the wrist turns so that we see the watchface head-on. The watchface grows and grows as the hands turn and turn. Eventually the watch face is so large that it takes up the entire screen, at which point it begins to crack. Behind it, we again see the pot in which the seeds were planted. A plant grows, and when it blossoms, an egg is on top. 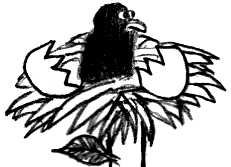 The egg hatches, and out pops a bird, who begins to fly away. THEEEEEE EEEEEENNNNNND! This little animation was made for "Introduction to Media Production" with Van McElwee. In the opinion of myself and many of my classmates, it was far and above the best of the class's projects (when we watched them all projected, mine got more "oohs" and "aahs," too). I drew each cell from scratch by hand with a pencil. I basically worked on nothing but this flip-book-turned-film for however long it took me to finish it--at work, at school, I was constantly just trying to make this thing so sweet, and I must say, for one of my first ventures into the world of filmmaking, I'm rather proud. It was nominated for, but did not win, a Webbie (Webster University Media Excellence Award) for "best animation" in 2001. I think it lost cuz it was still in flip-book form when I submitted it, cuz they showed a clip of the animation that won, and it was like a million times less complicated and less sweet than Timehatch. C'est la vie, though, my mecs.